Mission Viejo bee removal service provider Bee Busters wants to know, Do you Have Bees? Do you need a Mission Viejo bee removal? If you have a swarm of bees that are making you, your family or your neighbors uneasy, don’t hesitate – call your Mission Viejo bee removal experts at Bee Busters! Bee Busters has been in business in Mission Viejo since the early 1980’s. We are your local bee removal experts. Mission Viejo is the city in which David the owner of Bee Busters captured his first swarm of bees at the age of 11. You can read more about this on our history page. We focus on only honeybees, yellow jackets, bumble bees and wasps. We do not do general pest control. 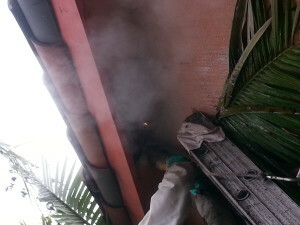 We are highly trained experts at removing flying stinging, insects. For all your Mission Viejo bee removal needs, Call Bee Busters today!! Bee Removal Mission Viejo – Bee Busters technicians will perform a thorough inspection to assess the bee problem, and determine the best course of action. The technicians will first identify the problem and recommend one of the following services: A treatment to simply eradicate the bees. Or doing a full removal. If the customer chooses to have the bees and honeycomb removed, the bee removal process will begin. 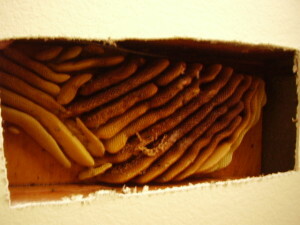 Depending on where the bees have lodged themselves, It may be necessary to cut the drywall or roof. 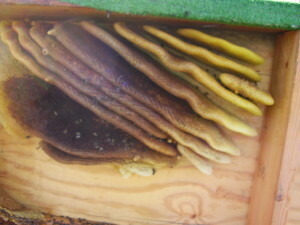 Sometimes, the honeycombs can be removed from the blocks at the eave. That’s the ideal location because in most cases, Bee Busters will be able to repair the opening at no cost to the customer. Beekeeping Mission Viejo – Beekeeping is a rewarding activity that people engage in either as a hobby, self-employment initiative or a second stream of income. That’s not to say beekeeping is easy. It’s not. They say you can tell a beekeeper by his firm handshake and bad back. Without beekeeping and beekeepers, there would be no local honey. Mission Viejo Bee Removal Service. Mission Viejo is one of the newest cities in Orange County, and we here at Bee Busters can remember a time when the area was still undeveloped hills. Where the Mission Viejo Lake is now there once was a beekeeper with a thousand hives. The city has grown up around us to become a vastly different place. With its extensive landscaping and winding roads, it is now one of the more beautiful suburbs of Orange County. Bee Busters owner, David Marder, was a member of one of Mission Viejo High School’s first graduating classes in the 80s, and did a senior project about bees. He used to keep some beehives on the school farm, but unfortunately with the increasingly litigious society of today, it is now too much of a liability to do so. David used to be able to pull 350 pounds of honey a year off a beehive in Mission Viejo, compare that to the national average of 70 pounds a year! The lush medians and preserved creeks allow a surprising amount of wildlife to co-exist with the modern developed state of Mission Viejo. Bee Busters – Your Mission Viejo bee removal experts. Spring and summer time is the season for bees, wasps and yellow jackets. During this time, the insects go in search of places to establish new nests. In the wild, they often nest in trees, but in a developed suburban area that often ends up being in homes, buildings, even underground. These pests can become a real nuisance, but the main concern is with the danger of them stinging somebody or an animal. They can cause damage to your property. If they get into a wall of your house, and are allowed to establish their colony, they will cause damage to your structure. They can also pose a risk to you and your family’s health. One or more stings from one of these defensive pests can send someone to the hospital, and in some cases lead to death. Statistics show that many people die from bees and wasps stings in the US each year. Thankfully, residents of Mission Viejo can rely on experts to get rid of these pests. Most people don’t know how to get rid of bees in their homes, we do. Bee Busters, Inc. is your professional Mission Viejo bee removal service provider for residential and commercial customers. If you see a swarm of bees, wasps or yellow jackets, you need a Mission Viejo bee removal. Act promptly and call in the Mission Viejo bee removal experts, Bee Busters @ 949-497-6264. 949-459-0024 or 714-731-1959. We always answer our phones. We are local, licensed, bonded and insured. Don’t get stung by some unlicensed pest control guy, go with a professional, go with Bee Busters.